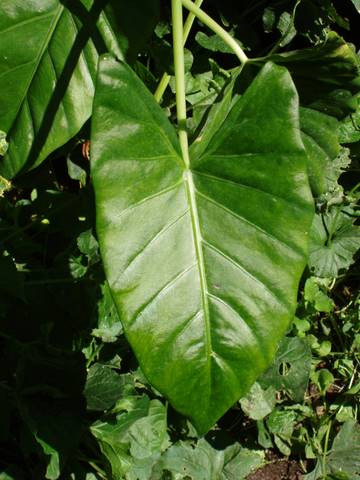 Perennial, large heart shaped leaves with pale yellow scented flowers followed by red berries. Only one Australian species (related to genus Colcasia). It grows in rainforests and moist coastal environments in Eastern Australia. Perfers shady moist well-drained soils, added composts and leaf litter. Grows well in amongst ferns and other shade loving plants. Good container plant. Known to be poisonous if eaten. Australian Aborigines eat young shoots after a lot of preparation and cooking.